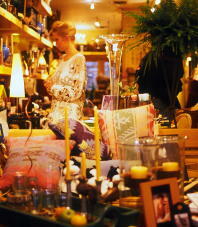 Holiday 2005 Newsletter - Wickwood Inn - Saugatuck, Michigan - romantic Bed and Breakfast near Chicago. 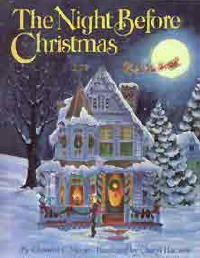 Very soon, all around our towns � �everywhere you go - with candy canes and silver lanes aglow� from mid-November through the New Year � we will live in an old fashioned Christmas card!! 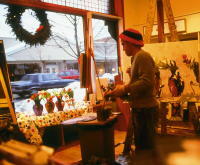 Snow or no snow, Saugatuck brings memories to life. 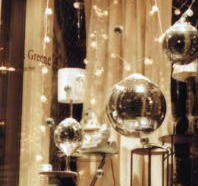 Shops will be brimming and welcoming with warm mulled cider and a �Night Before Christmas� shopping spree. Restaurants cozy and festive with Holiday menus. Horse drawn carriage rides through town. Twinkling lights are everywhere. "It is good to be children and never better that than at Christmas"
Wickwood will be aglow from top to bottom � inside and out beginning November 18th. At Holiday time � we believe �more is more� � so each and every guest room has its own tree shimmering and gleaming with ornaments, ribbons and lights. The scent is of pine, cinnamon and firewood. 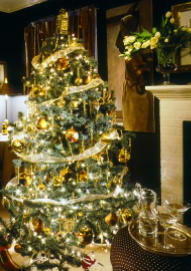 There are boughs, garlands, and wreaths everywhere, mingling with the kitchen's Christmas aromas. Join us at Wickwood and catch our Christmas Spirit! November 11 Open House for Kenyan Artist Bulinya Martins SCA 5 p.m.
Let us make them such cheer. There�s no question about the greatest luxury we have today. It�s Time. Time to love. Time to laugh. Time for a walk in the woods to watch the birds and listen to the silence. Time to play cards � or a board game. Time for good talk. Time for a Holiday concert or the blues. Time to read together. Time to give your time to your family � those friends you love � and to strangers who could use your time and attention. In this the season of giving � give generously of your time. And remember to find some time for yourself to count your own blessings - one by one. We have mild winters � and not as many blustery days as we once did, so it�s great to be outdoors � snow or no snow. 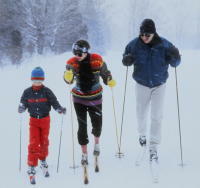 We�re surrounded by nature � with cross country skiing, ski trails, snowshoe hiking hills, a skating rink in Douglas, hills for sledding, paths for woods walks and dune climbing, and miles of snow mobile trails in the Allegan State Forest. It makes it so nice to come back to a fire! Join us on the weekend of November 18~20 in shops all around Saugatuck for a search for Santa! You may be the cleverest one and win the prize of a five hundred dollar shopping spree. It�s one of many prizes. Good Luck!! Later, in New York, a visit to �Vincent Van Gogh: The Drawings� at the Met gave us an enlightening peek into the true talents of this artist. They are brilliant examples of the varieties of lines that can be made with a simple tool � a reed plucked from a marsh. We encourage you to catch this exhibition before it ends in January. And at MOMA � Danny Meyer�s Modern Restaurant serves stunning food � truly memorable! Of course a visit to NYC wouldn�t be complete without dining at Fred�s �one of our favorites (and seemingly everyone else�s) at Barney�s!! Fabulous! "No civilized person goes to bed the same day he gets up"
1-2 cups whole milk ( we actually like 1 � but the resulting cocoa is very dark and thick, like pudding � add milk to your taste). Over medium heat, melt the chocolate and heavy cream stirring regularly not to burn. (We like to stir with a wire whisk to add a little air.) Add milk to taste and bring to the boil for a second. Serves 4-6 small 6 ounce servings. We prefer small tastes � more often than, caloric once-a-year hot chocolate. Serve with real whipped cream atop! Spiced Hot Chocolate is all the rage � so � be adventurous with smidgens of cinnamon, ground clove, orange zest, black or cayenne pepper, or a sprig of thyme or tarragon. A trick: If you make hot chocolate � refrigerate � and reheat, you�ll always have it at-the-ready and it will be even thicker still!! "Ring out the old, ring in the new, ring happy bells, across the snow: The year is going, let him go. Ring out the false, ring in the true." Boost the natural aromas of the season throughout your home with some of our favorite candles and room fragrances � Jo Malone, the British wonder has fabulous home and personal fragrances � Pine, Eucalyptus, Orange, Mint � jomalone.com; Catherine Memmi from Paris with the unusual but addictive Black Coffee (our personal favorite to use as a cologne), White Orchid, Lilac, Ginko � catherinememmi.com; San Francisco�s Agraria with air essences, potpourri, candles, sachets, and colognes in their famous Bitter Lemon blend and Lemon Verbena � agrariahome.com; And New York�s Harry Slatkin and Bendel Collections from Bath & Body Works stores nationwide � our favorite home scent this season is a mixture of three candles burning in different rooms with the fragrances mingling � Firewood, Cedar, and Spice � bathandbodyworks.com. We think they make the best scents this Season! "Animal crackers and cocoa to drink, that is the finest of suppers, I think"
There�s a hot new chicken around � thanks to Canadian poultry breeder Peter Thiessen. Now chicken is much more than �free range� � it�s a borderline facsimile of France�s Poulet de Bresse, considered the best tasting chicken in the world today. Already found on the most august menus � Per Se and Alain Ducasse � The Blue Foot or Poulet Bleu is a North American version of the mythical poulet de Bresse. With snowy white plumage and a bright red comb, and blue feet, this chicken has flavor unsurpassed. Trust us, they really taste like chicken � available from dartagnan.com. Don�t be surprised when it arrives with head and feet still intact. We think traditions are better than presents, don�t you? Before Thanksgiving The Women of Wickwood (plus Bill) have drawn names so we have four full weeks of Secret Santa-ing. One of the best parts of Secret Santa�s is being surprised during your �everyday" goings on!! A thoughtful little present will surprise a Housekeeper amidst piles of towels, is found in your purse after you�re home, or is tucked behind the raspberries with your name on it. It makes every day fun � and you�re tickled pink when you least expect it. The intrigue builds as we wait to discover our Santa at the Wickwood Christmas Party! From coast to coast most holiday dinners have as their centerpiece � a bird!! The size and origin varies, but the selection has never been broader. 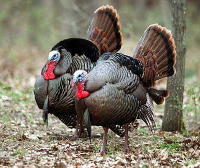 If you don�t raise or hunt your own � you can still bring adventure to your Holiday table. And a much more flavorful entr�e!! You�ll find the rare Barred Plymouth Rock Chicken, the exceptional Dark Cornish Chicken, and fresh Bourbon Red or American Bronze Heritage Turkeys at heritagefoodsusa.com. At d�Artagnan (sometimes you here to watch out for the shot), the selection is exciting and broad � ducks, capon, chicken, organic or wild turkeys, Guinea hens, pheasant, partridge, poussin, quail, Scottish grouse, squab and geese. There�s also whole baby pigs, kid goat, rabbit and wild hare, venison and wild boar. All at dartagnan.com. There�s not a reason in the world for boring Holiday feasts!! "Hearts warmer grow, gifts fully flow, for Christmas-time has come." All around our villages the wineries, art galleries, and shops all host receptions to make the Holidays more festive for six weeks. The weekend of November 18-19 is the kick-off in Saugatuck and Douglas with extended shopping hours, music, refreshments, holiday specials, good cheer, warm treats, special wrapping services, all in an effort to give you the Holiday Spirit and help make your Holiday gift giving a joy. "It is a fine seasoning for joy to think of those we love"
It�s fun to climb up in an old-fashioned buggy and be pulled by four Clydesdale horses through the streets of our sleepy villages. It�s a step back in time for just an hour of so. Sing Jingle Bells as you go. Have a glorious Holiday Season filled with love, laughter and great feasts! !